I will provide an overview of the seismology, surface ruptures and landslides produced by the Mw7.8, 14 November 2016 Kaikoura earthquake, and discuss the earthquake in the context of the current version of the national seismic hazard model (NSHM) for New Zealand. A total of 13 faults or fault zones ruptured along a c. 180km long zone during the earthquake, including some that were unknown prior to the event. The earthquake was a remarkable event, both for the complexity of the rupture and number of faults involved, and the fact that it ruptured obliquely across the grain of the northeast-striking Marlborough faults. Mark is an earthquake scientist with a multidisciplinary background in geology and seismology. He obtained his PhD at the University of Nevada Reno, and his BSc and MSc(Hons) at the University of Otago. He is specialised in the integration of geological, seismological and geodetic datasets for seismotectonic and seismic hazard modelling. He moved to his present position at Otago in February 2016, and prior to that was a Principal Scientist at GNS Science. He led the development of the last three versions of the national seismic hazard model for New Zealand (1998, 2002 and 2012), which is the hazard basis for the New Zealand Loadings Standard. In addition to his many local projects he is currently working on seismic hazard research for nuclear power plants and hydro dams. 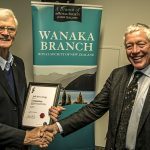 Mark has been the recipient of two Otto Glogau Awards from the New Zealand Society of Earthquake Engineering for his publications, was Society President for the period 2004-2006, and was made a Fellow of the Society in 2007. He is currently an Associate Editor for the Bulletin of the Seismological Society of America. Mark was born in Auckland but lived most of his childhood and teenage years in Blenheim. He has been married to his wife Jane for nearly 27 years, and has two boys, Lewis (16) and Toby (12).